Janel is a mother, writer, reader, runner, lover of outdoors, cook, friend, and dreamer. She's married to James, with whom she has three children: Evelyn (13), Charlotte (10), and Calvin (6). In this longform (8200 word) essay, Sef brings his reading of Kafka to life through a web of associations. I do not think it is necessary to read the entire text of his essay to get a feel for the work he is doing of editorial, historical, and creative connotation. Interestingly, the London Review of Books sponsored this project, which took 14 weeks and many people’s labor to make. The explanation for the essay states that the goal was to use “digital technology to loosen and enhance the structure of the essay,” and it certainly does that. Although Self wrote the main body of the essay, “much of the additional content was researched or created by over 70 others,” presented in various forms including music, digital media, videos, photography, and drama. 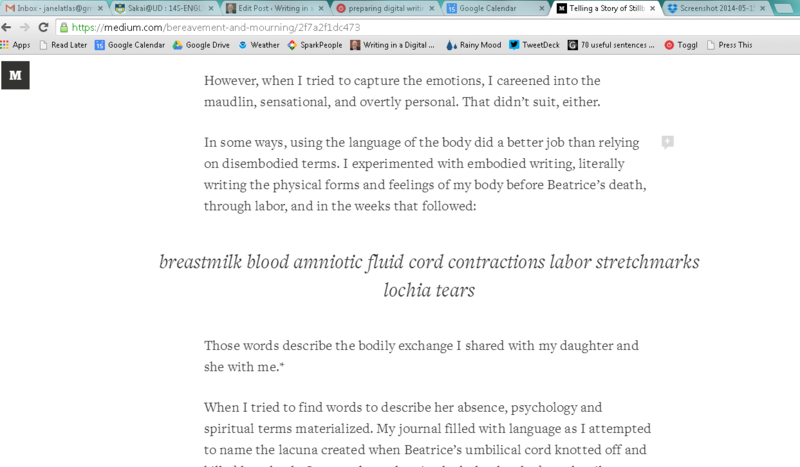 The user interface permits readers to open and close bubbles to the right side of the essay. There is also a freeform navigation web menu at the top of the page for readers who want to browse through the the material that way. I found that more compelling than reading the entire essay straight through. The various supplemental–and yet that’s not quite the right word–elements of the digital essay actually served as entry points into Self’s rather heavy prose. The very reason I respect this piece of work–the quality and expansiveness of it–are the very reasons I also nearly chose something else to share here. It is really overwhelming to see such a massive undertaking so beautifully pulled off. Overwhelming in an admiration sort of way. Also in a holy-smokes-I-couldn’t-ever-create-something-of-that-scale way.